Do you know what your wedding invitations speaks of you? The choice of paper and wordings present guests with a glimpse into the flavor of your relationship. Fonts and color exhibit your personal style. Designs connote the theme and tone of the overall ceremony. In this essence, what is an invitation but an illustration of the rapport you share with your sweetheart! We totally get why you’d want to create a fine first impression when announcing the two of you have chosen the first day of your new life of togetherness. And our philosophy is to make the announcement a treasured souvenir that family and friends not only remember, but also hold on to long after the festivities are done. Browse through our outstanding selection of marvelous invitation boxes made of the finest silk and handcrafted by a select group of skilled Thai craftsmen. We are known for our elegant designs, use of high-quality materials and uniqueness. Should you not find precisely what you’re looking for, use our custom color option to widen your array of choices. Thai Silk Invitation Boxes are designed to capture reflections of the couple that sends them out. Our craftsmen keep the boxes handy so that you can have them mailed with invitations or delivered with wedding goodies and more. Appeal to your guests sense of touch with our range of textured silks. Appeal to their sense of sight by adding a pop of color that is coherent with your personal style. In today’s world of electronic mails and social media invites, there’s something rather divine about receiving an invitation in the mailbox. Isn’t it? And if the invitation happens to come in a gorgeous piece of handcrafted silky delight it just becomes celestial! 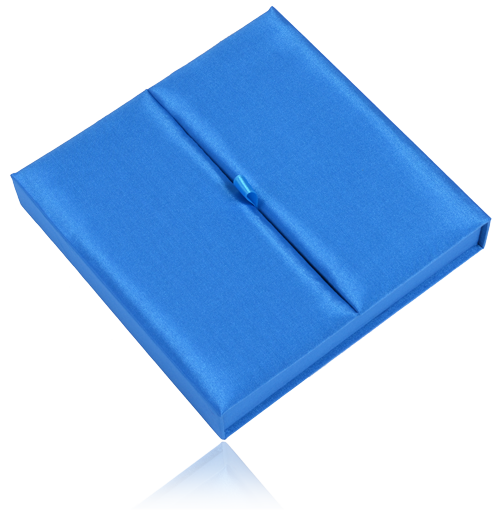 Give your guests the happy surprise of a royal invitation to any milestone that is worth celebrating with Thai Silk Invitation Boxes. Oh and did we mention we are wonderfully cost-efficient? Set the standards for a great celebration with the invitation itself. Thai Silk Boxes are where your invitations dress to impress. Get your fingers on the ones you love today!